The 2013 JConcepts Clash is building and acquiring entries on a daily basis. 440 pre-entries are already in for the most unique event of the year. Ryan Maifield, Dustin Evans and JR Mitch are all signed up and ready to battle once again. 2wd modified, 1/8th nitro expert and 1/8th e-buggy remain the largest classes of competition. A fresh track layout designed by Paul Wynn is in the finishing stages, widescreen Clash awards are in process, 7th annual Clash t-shirts are ready and has been finalized. The track layout flows like water, the shading on the drawing represents elevation which is a focus inside Flowood R/C park along with rhythmic jump sections and speedy chicane driving. Are the jumps doubles, triples, quads or rollers? We will find out when that first vehicle hits the track September 6-8, 2013. RedRC will be back to completely cover the event with the journalism they are known for, including top of the line photography and videography. 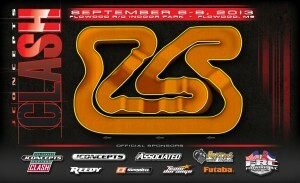 Please visit please RCsignup.com today to pre-register for the 2013 JConcepts Clash. Prepayments are also now being taken to secure your place in this year’s event.